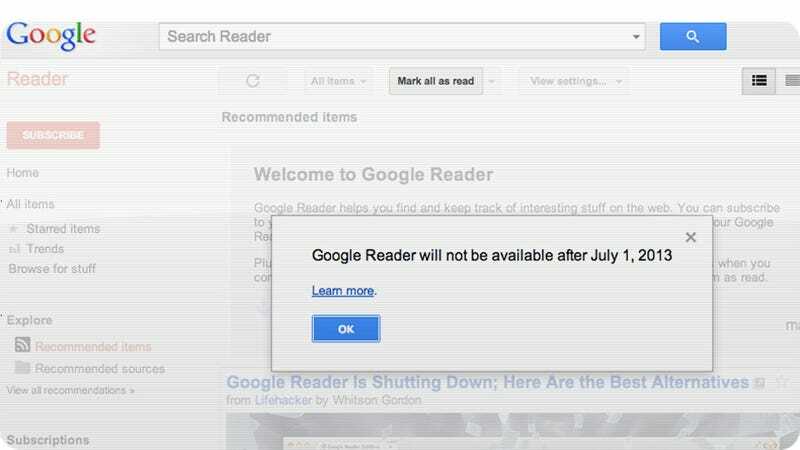 According to a report from AllThingsD, lack of customers wasn't the only reason Google Reader will meet its untimely end on July 1st. It was also, for Google, a potential source of bungling that it wasn't worth shoring up. Google has run into so many privacy issues of late—Wi-Fi snooping chief among them, but there have been plenty of others—that every team within the company needs compliance staff looking after them. Since Reader didn't even have a product manager at the time of its sentencing, it was unlikely that Google was going to staff up lawyers to keep its nose clean. Was a "Rogue Engineer" Responsible For Google&apos;s Wi-Fi Snooping? A few things become more clear. One, that Reader definitely wasn't profitable. Two, that Google's more willing than ever to axe projects that don't help the bottom line. And three, that the company is currently in a position where it has access to so much of your information—and such limited means to control it it—that it's worried it will do something untoward or illegal with it without even trying.